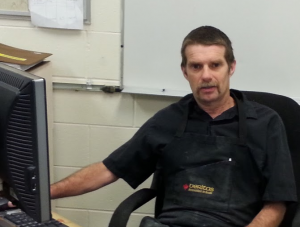 For almost 20 years Mike Annetts has been an Industrial Arts teacher in Manitoba, Canada, for students from grade 7 through 12, and he has been running a ShopBot tool in his classroom for over a decade. When we reached out to him to see if he’d like to talk about his and his students’ experiences with CNC, Mike was enthusiastic to say the least. “I would just like to thank Shopbot for making such a great machine!” said Mike. “I truly believe that it is a product that does what it says and the support we have gotten is amazing. It was over 15 years ago that Mike was first able to bring a CNC tool into his school. 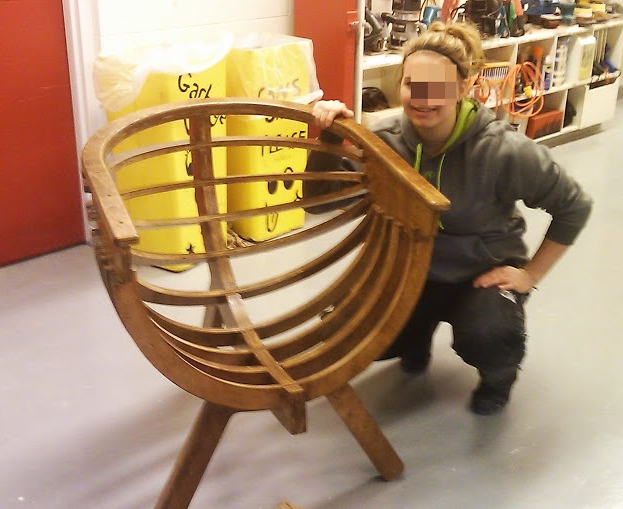 After a disappointing experience with it, he studied other solutions, including spending a lot of time researching ShopBot Tools by reading the ShopBot user forum. 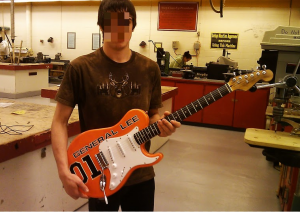 “This research, as well as the company’s reputation for support” convinced Mike that the ShopBot was going to be a better fit for his classroom. He secured funding from his school board and purchased a 4 X 8 gantry tool, and has since upgraded the tool to running with a spindle. I caught up with Mike by phone recently. MB: How do students react when first being introduced to CNC? Student with her small folding table project. 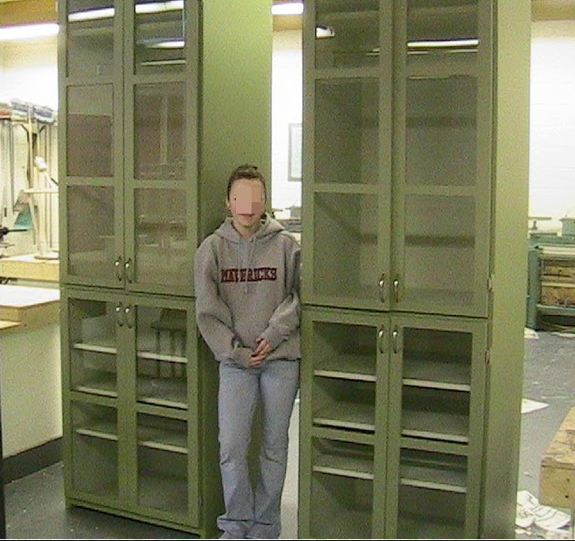 Mike has blurred faces to protect students’ privacy. MA: They think that it is very cool. 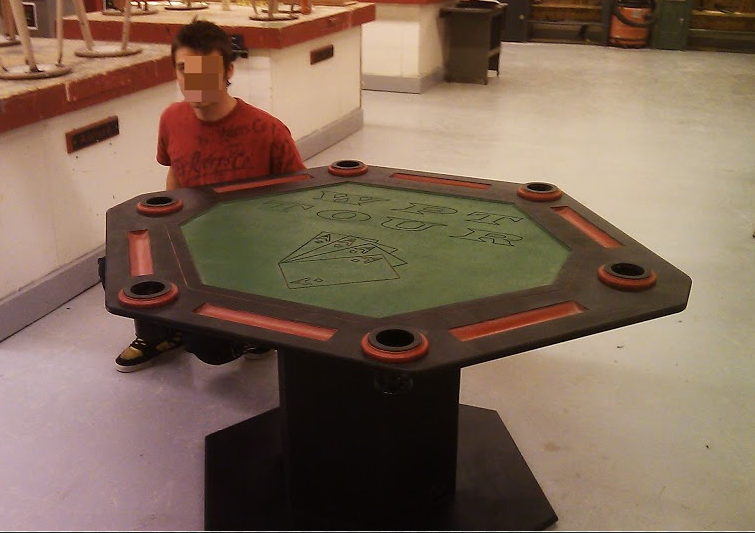 The first CNC project we do is a folding table, and they get to use the Shopbot to carve a graphic design onto the tabletop. Our students are rural students in a mainly farming area so they do not have much of a chance to see any real manufacturing of products. They love being able to choose a design from the internet to use as a starting point, or even draw their own on paper. 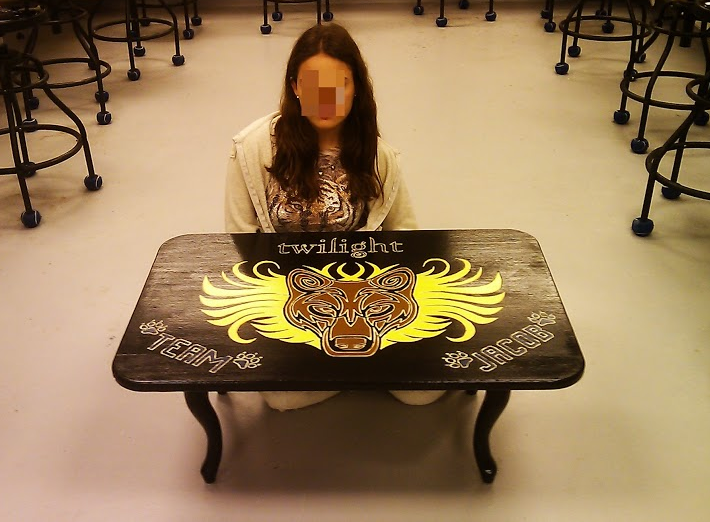 We then take a photo of the picture, convert it to a vector image, and then cut it into their table top. MB: How does your work differ with different age students? MA: The grade seven and eight students just touch on the software (Mastercam) and I have a template made up which they follow so the learning curve for them is easy. As we go up into higher grades the students struggle with the software part of the design. They have to design their own projects —no blue prints — and draw them in 3D using Mastercam, and then draw out the layout on virtual plywood and assign tools and tool paths etc. Finally, they cut them out and assemble the projects. They do all of the tool paths, verification, bit selection, etc. Together we post them and check for errors before the file part is actually run. MB: Can you describe some of the projects? MA: Sure. Some of the projects we have done in the past have been anything from simple signage, cabinetry, some 3D items such as making stepping stone molds, fish hook molds out of aluminum, basically anything we can think of. I hope to get into the 3d stuff more which would include making molds for Jell-O, chocolate etc. We have a vacuum forming machine so we would make the mold from wood and then vacuum-form the actual Jell-O mold around it. 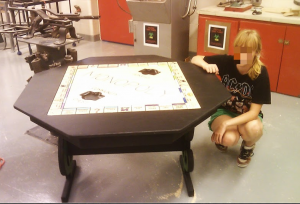 MA: Another project, which I am trying to develop further, is making a “Rube Goldberg” puzzle where the students have to construct stuff on the Shopbot to make some sort of goofy apparatus. An example would be putting a candle out by starting with the snap of a mousetrap, which would trigger another action. This would continue for numerous steps until the candle is extinguished. We have done marble machines in the past using the Shopbot to cut the gears, pulleys, etc. These machines continually rotate marbles through different mechanisms and are an awesome project for developing problem-solving skills. MB: How has your experience with the ShopBot been? MA: We first purchased the Shopbot approximately 15 years ago and it was definitely the best decision we ever made. With the machine, we have opened up a complete new spectrum of opportunity for student projects. We have used it as a cutting tool as well as a marking tool for laying out sheet metal designs. In addition, I teach basic electronics and we have used it to cut out circuit boards when needed. I have had discussions with past home economics teachers about even utilizing it for laying out full size-clothing patterns that the students could use in designing and manufacturing personal clothing. The possibilities of the Shopbot are only limited by the imagination. MA: The machine’s operation has been practically flawless. Over the years, we have upgraded to a spindle, which we found necessary to reduce the noise level in the shop, and we upgraded the internal board to decrease cutting times. We occasionally lubricate the gears and that is about the only maintenance we do. I constantly use the Shopbot forum and the expertise of other owners to help me develop new ideas, and techniques. When we purchased the machine, I had zero knowledge of the CNC process and reading the forum greatly made it easier for me to get into it. MB: As I am the only Industrial Arts teacher here in McCreary it gets crazy working with the students as there are many of them and only one of me! Usually there are one or two students who seem to catch onto the process faster than others and I try to use them as a resource to help their struggling classmates. Each of our students designs a different project so there are very many individualized questions to answer; so these advanced students are greatly appreciated! MB: At first when we purchased the Shopbot, we treated it like a “stand alone” piece of equipment with specific functions. Now it is regarded as just like another piece of equipment in the shop to get the job done with and that is my intention. It is so involved in industry that using CNC equipment should be a standard skill coming out of high school shop programs, just like using a table saw, or any other tool. 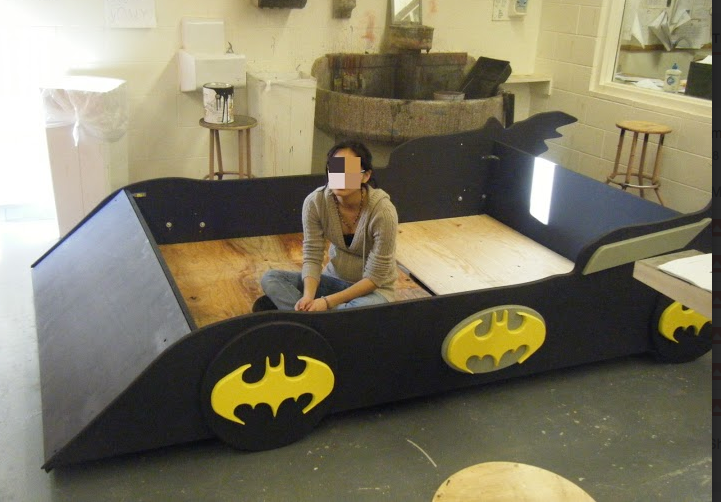 Students now see it as an opportunity to make even “cooler” projects and they do! MB: What software programs do you use? MA: The programs, which we use with the Shopbot, are Mastercam and Vector Magic. Mastercam is a great program, which allows us to do the cabinetmaking, sign making, 3D work, etc. all within one program. It outputs the Shopbot code directly and allows us to use multiple tools in one posting which is nice. Vector Magic is a fantastic program for allowing the students to download a piece of line art and convert it to vectors. 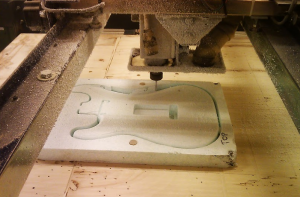 It is amazingly simple to use and I would recommend it to any teacher using CNC. It took me 15 years of trying others but is for us by far the best we have used up to date. MB: Do your students use the ShopBot to make products for fundraising? MA: Yes, absolutely. 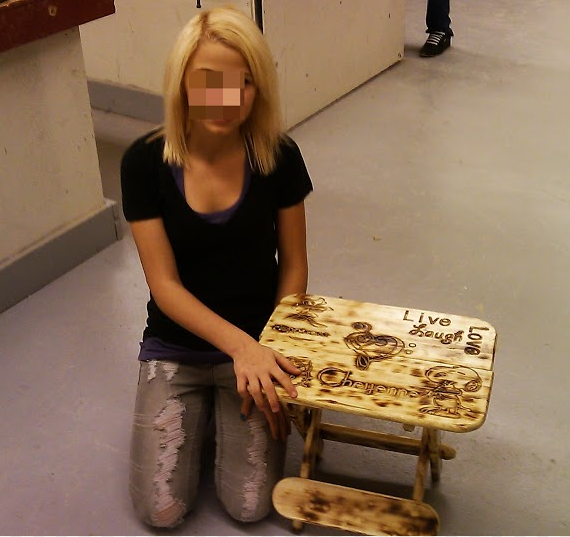 In the past, we have used the Shopbot to mass produce items to sell at fundraisers. Our last project was a board game which sold really well. After the shop deducted our expenses, each student took home their share of the profits to spend as they please. The grade nine students worked together with me to research our small town customers in regards to age, gender, finances, etc., and then came up with some product ideas. 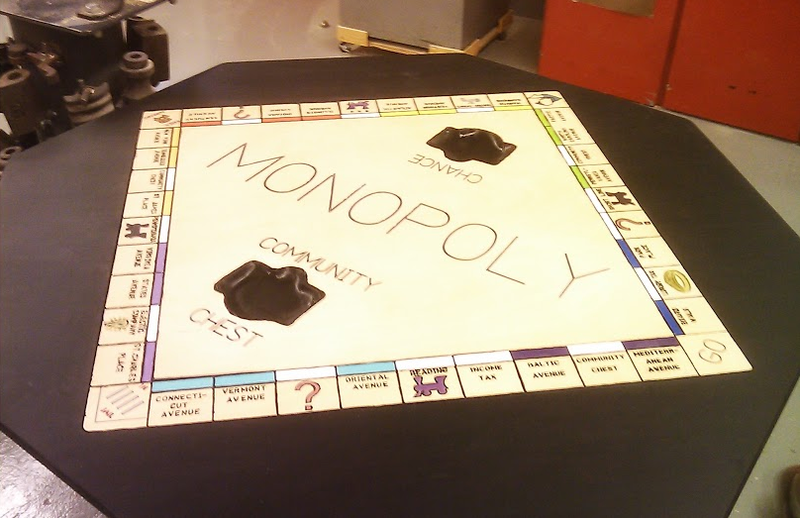 After quite a bit of discussion, we chose to design and sell a game board similar to a “Sorry or Aggravation” type of game. 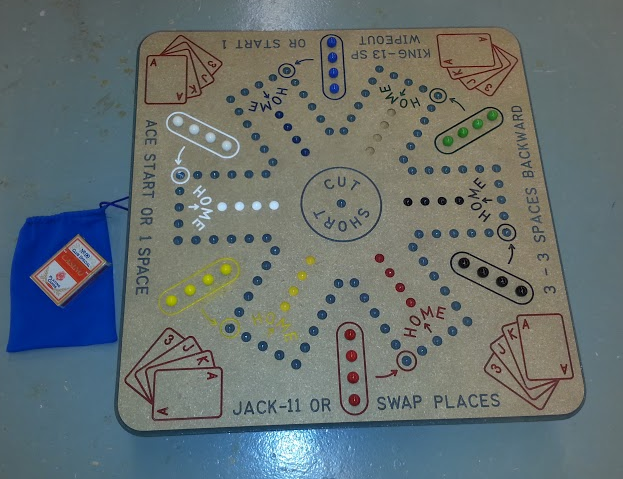 MA: The students and I then designed the game and started up an assembly line with the Shopbot doing the cutting and the students the finish work. We placed the product in some local businesses and sold some at the school Christmas concert. They all sold and it was a great entrepreneurial learning experience for the students, and was that much more successful because we had the Shopbot to utilize. MA: Overall and to sum it all up here, I can say that having the Shopbot was a huge boost to our program. It does make teaching the class much more challenging but the rewards are much greater. The students are actually designing their projects and putting a great deal of thought into them, which to me is what we want as teachers. The parents are amazed at the quality of projects going home and to be honest so am I sometimes. I rarely get students here who have ever really “built” something. However, by the end of the program they are taking stuff home that will be passed down through the generations. They are immensely proud of their accomplishments as well as they should be. They work hard, make mistakes, re-do it and in the end they have something to show off — something that “they” did and it wasn’t the instant gratification that is so relevant in kids’ lives today. MA: They gain confidence in themselves and that confidence spreads to other areas of their lives. 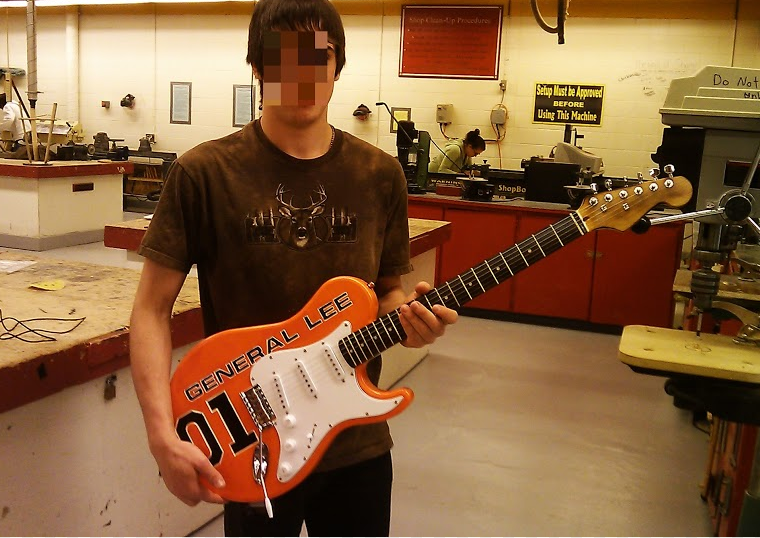 Frequently those kids who do not get higher marks in other classes are the ones who excel with the CNC aspect of the program including the Shopbot. They find it interesting so they work harder at it and then they become the “go-to” students for the other students in the class who may be having difficulty in the shop. These students help out with the Shopbot operation and you can see their confidence grow every day. You can learn more about full size ShopBot Tools here. And visit ShopBot’s education page for more information about integrating digital fabrication technology into your classroom.